Josh Hutcherson, wearing a Marc Jacobs leather jacket he got from a “Hunger Games” press tour. Josh Hutcherson, who has been acting since he was 9, is quite the veteran of sci-fi. At 25, he is perhaps best known for playing Peeta Mellark from “The Hunger Games,” and this month he will starring as a time-traveling janitor in Hulu’s “Future Man.” Off camera, Mr. Hutcherson prefers a more earthbound existence, hanging out in his Los Angeles home in T-shirts, jeans, caps and Adidas Sambas. Shirt There is this company called Kelly Cole. They have one shop here on La Brea. I was just kind of walking around and found my way inside the store. They have these T-shirts they make themselves. They have a vintage feeling but they’re new, so it’s great because they don’t wear out as easily. I have them in every color. I get five green, five blue, five gray and so on. I’m that guy that will buy a bunch of the same thing if I find something I like. Jeans Once I find the right jeans, I wear them till they fall apart. The ones I like right now are by Ksubi. They’re black; I haven’t worn a blue jean in years. Stylewise, I’ve always felt more New York. I wear dark colors and flannels, and simple, modern styles. But I’ve never set out and said, “I want this style now.” I used to wear flat bills and Air Force Ones for a minute. I was goth when I was 10 for a minute. And then I wore Abercrombie all day every day. Now it’s whatever my eye is drawn to. Jacket I have this brown leather jacket by Windward. I found it at American Rag Cie. It’s almost a bomber style, and it’s old looking and smelling, with a fuzzy collar. It’s super-warm, so unfortunately I don’t get to wear it that often in L.A. Every now and then, I get to bust it out. I also have a black Marc Jacobs leather jacket that is kind of rock ’n’ roll, almost ‘50s, but with softer leather and it doesn’t have a bunch of bells and whistles with zippers and such. I got it from one of the “Hunger Games” press tours. Literally, I would say 85 percent of my clothes are from press tours. Shoes I’ve been wearing Adidas Sambas — the classic black and whites. I like how they look with black jeans, but I’m still trying to figure out what to do with the big tongue that comes with it. But if there is ever a soccer game going on, I can jump right in. I currently have a torn LCL though, so that’s not happening anytime soon. 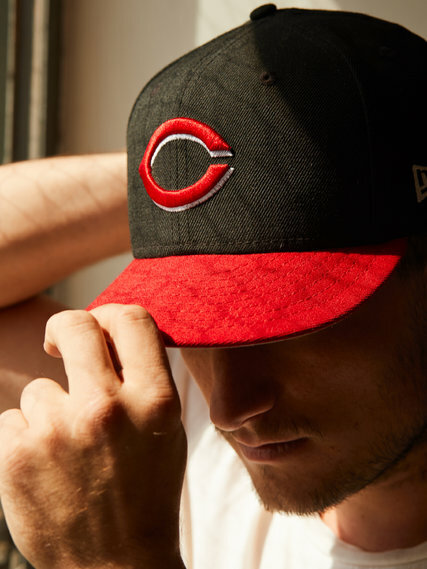 One of Mr. Hutcherson’s favorite accessories: a Cincinnati Reds cap. Accessory I wear a hat most days when I go out in the world. I grew up wearing them. I have a Cincinnati Reds cap I love a lot. One of the hats I wear is by Flush Records — the company is owned by one of my buddies. But I always wear dark hats. Actually, for a wrap gift for “Future Man,” I got these black hats made with my character’s name, “Futterman,” on them. Another friend of mine has a jewelry company called M. Cohen. I wear his bracelets every day. He throws together a stack. They’re kind of earthy but not flashy.